I am pleased to announce that today my blog was recognized by the Geneabloggers website. Please note the Geneabloggers badge on the right side of the front page. 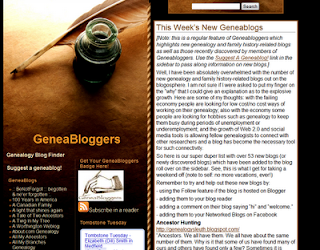 Geneabloggers is a great resource for various genealogical blogs. I would encourage you all to browse through the offerings at this site. Congratulations on becoming part of the Genea-Bloggers group! I look forward to reading more of your work. Hi Jennifer! Isn't it amazing how the geneabloggers community has taken off? I am amazed. I saw your post here and wanted to give you a "shout out." I love what you've done here and wanted to tell you that it looks awesome too! I have awarded you a Kreativ Blogger Award. Please see my post at Oh Blah Vi, Oh Blah Va. Enjoy!